Sir Edward Burnett Tylor (October 2, 1832 – January 2, 1917), was an English anthropologist, often regarded as the founder of cultural anthropology. Tylor began his studies during travels recommended for his health, where he encountered cultural differences and joined archaeological investigations of prehistoric human societies. He was famous for adapting Darwin's theory of evolution to the study of human societies, introducing the concept of "survivals" in human development. These "survivals" were ideas, beliefs, and customs that Tylor observed in the modern world that had endured from the past primitive cultures, but which he regarded as anachronistic. In particular, he viewed religious beliefs and practices in this way, viewing human development as unilinear from primitive animism through organized religion, into a world of scientific and technological understanding. Tylor's theories, although long discarded, and his methods of analysis led to many honors, including a knighthood, and laid the foundation for anthropology as a science. Despite his limitations, including accusations of ethnocentric bias, Tylor's unilinear model of development recognized that human beings share a common history, thus a common origin, and a common destiny. 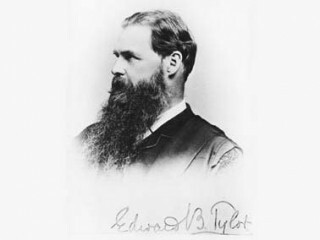 Edward Burnett Tylor was born on October 2, 1832, in Camberwell, London, England into the Quaker family of Joseph Tylor and Harriet Skipper. Alfred Tylor, the geologist, was his elder brother. His parents were members of the Society of Friends, at one of whose schools, Grove House, in Tottenham, Edward was educated. At the age of 16 he was taken out of school to help in his father‘s business. In 1848, he entered his father's company, J. Tylor and Sons, Brassfounders, on Newgate Street, in London. After working for seven years behind the desk his health started to deteriorate. He was threatened with consumption and forced to abandon work in business. As treatment for his lungs his doctor recommended traveling, and so Tylor left England. During 1855 to 1856 Tylor traveled to the United States. In 1856, on a trip to Cuba, he met a fellow Quaker, Henry Christy (1810-1865), an archaeologist and ethnologist, who became Tylor’s good friend. Tylor's association with Christy greatly stimulated his awakening interest in anthropology, and their visit to Mexico, with its rich prehistoric remains, led him to undertake a systematic study of the science. After his return to England, in 1858, Tylor married Anna Fox, with whom he remained married until the end of his life. The couple did not have any children. They lived comfortably on Tylor’s family inheritance. While on a visit to Cannes he wrote a record of his observations in Mexico, entitled Anahuac; or, Mexico and the Mexicans, Ancient and Modern, which was published in 1861. In 1865 appeared Researches into the Early History of Mankind, which made Tylor's reputation. This book was followed in 1871 by the more elaborate Primitive Culture: Researches into the Development of Mythology, Philosophy, Religion, Language, Art and Custom. In 1881, Tylor published a smaller and more popular handbook on anthropology. In 1871, Tylor was elected Fellow of the Royal Society, and in 1875 received the honorary degree of Doctor of Civil Law from the University of Oxford. He was appointed keeper of the University Museum at Oxford in 1883, and reader in anthropology in 1884. In 1888, he was appointed first Gifford lecturer at the University of Aberdeen. In 1896, he became professor of anthropology at Oxford, occupying the first such chair in the English-speaking world. Tylor retired from teaching in 1909, and was knighted in 1912. He and died in Wellington, Somerset, England, in 1917.
that complex whole which includes knowledge, belief, art, morals, law, custom, and any other capabilities and habits acquired by man as a member of society. Tylor studied languages, art, rituals, customs, myths, and beliefs of people of different cultures and concluded that the human mind functions quite similarly everywhere. He saw a universal pattern of development in every culture. Based on that he believed in the unity of humankind, as societies progressed in their evolutionary development from primitive to civilized. He propagated the view of unilinear evolution, namely that human cultures develop from a single primitive form as one human history: "The past is continually needed to explain the present, and the whole to explain the part." Tylor held an evolutionary view about the development of culture, particularly of religion. He believed that animism was the earliest form of religious belief, and that religious thought progressed over time to more civilized forms of organized religion. 3. civilization: that is, cultures based on writing and the urban life. Although he believed in the progressive curve of human evolution, Tylor claimed that people in civilized cultures may regress to more primitive forms of behavior. He considered religious behavior to be an example of primitive behavior. In his view, religion was connected with superstitious thinking, based on magical belief in supernatural powers. As such it had no place in the civilized world. However, despite the rational thinking that characterizes civilized world, religion still somehow survives. Taylor believed that this is possible due to faulty logic people use. He called this type of behavior a “survival,” for it survived in a more advanced environment. It is a harsher, and at times even painful office of ethnography to expose the remains of crude old cultures which have passed into harmful superstition, and to mark these out for destruction. Yet this work, if less genial, is not less urgently needful for the good of mankind. Thus, active at once in aiding progress and in removing hindrance, the science of culture is essentially a reformer's science (Primitive Culture, 1871). Tylor is often regarded as the actual founder of anthropology, which was in his time called “Mr. Tylor’s science.” He wrote the first article on anthropology as a science in the ninth edition of the Encyclopedia Britannica (1878), and published the first textbook in anthropology Anthropology: An Introduction to the Study of Man and Civilization, in 1881. At the University of Oxford he became the first professor of anthropology in the English-speaking world. His views were often regarded as rather ethnocentric, and many of his theories, including unilinear evolutionary development and his theory of religions, have been discarded by modern anthropologists. He however, remains known for his groundbreaking use of statistical data in his analysis of societies, and his pioneering work in establishing anthropology as a science. * Tylor, Edward B. 1970. Anahuac: or, Mexico and the Mexicans,: Ancient and modern. Bergman Publishers. * Tylor, Edward B. 2001. Researches into the Early History of Mankind and the Development of Civilization. Adamant Media Corporation. * Tylor, Edward B. 1867. On the game of patolli in ancient Mexico, and its probably Asiatic origin. Bobbs-Merrill. * Tylor, Edward B. 1976. Primitive culture: Researches into the development of mythology, philosophy, religion, language, art, and custom. Gordon Press. * Tylor, Edward B. 1872. The philology of slang. Macmillan. * Tylor, Edward B. 1970. Religion in primitive culture. Peter Smith Publisher. * Tylor, Edward B. 1921. Anthropology: An introduction to the study of man and civilization. D. Appleton and Co.
* Tylor, Edward B. 1889. On a method of investigating the development of institutions: Applied to laws of marriage and descent. Harrison & Sons. View the full website biography of Edward Burnett Tylor.